BCAL Diagnostics is a wholly Australian-owned biotechnology company based at the National Innovation Centre at Eveleigh. Since its establishment in 2010, BCAL Diagnostics has been striving to revolutionise early detection and screening for breast cancer for women worldwide. BCAL Diagnostics is developing a transformational blood test known as the Breast Cancer Associated Lipids (BCAL) test. It has the potential to be used for breast cancer screening, prevention and monitoring. It is set to be safer, and more cost-effective, accurate and accessible than existing methods used to detect breast cancer. The current model for breast cancer screening relies on a woman attending a clinic for breast imaging. In a world first, BCAL Diagnostics’ test allows detection of breast cancer via a blood sample taken from the woman and analysed remotely for lipid biomarkers. This could eliminate the need for mammograms and ultrasounds for screening. post-intervention: monitor patients who have had breast cancer for recurrence and the effectiveness of treatment. The BCAL test is due to be subjected to clinical trials in the community during late 2018 and, depending on the results and regulatory approvals, the BCAL test could be on the Australian market in 2019-20. BCAL Diagnostics’ aim is to shift the established paradigm from breast cancer management to breast cancer prevention. Once commercialised, the BCAL test will enable earlier detection of breast cancer and has the potential to prevent cases of breast cancer. It is projected there will be more than 18,000 new cases diagnosed in Australia in 2018. Globally, breast cancer now represents one in four of all cancers in women. While mammograms are state-of-the-art technology, they are only targeted at women between the ages of 50 and 74. They can be difficult to access for women outside major cities. Patients often feel great discomfort and require further testing when results are unclear. The BCAL test will allow women anywhere in the world, regardless of their age or location, to be screened for breast cancer less invasively and more accurately. The BCAL test would allow women to be screened at a time and place convenient to them. The test can fit into a woman’s routine health regime. In addition, with such high levels of accuracy, the BCAL test may provide greater peace of mind between annual checks. In 2017-18, BCAL Diagnostics received support under the NSW Government’s Medical Devices Fund (MDF) and its Commercialisation Training Program. 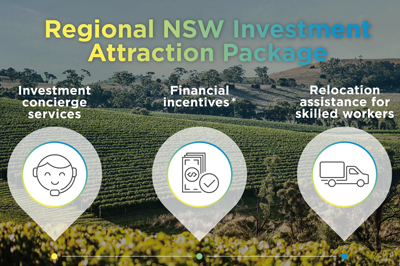 The MDF is an $8.2 million per annum fund which helps to encourage investment in the commercialisation of medical devices and related technologies in NSW.